As part of UCL Art Museum's exhibition The composition has been reversed, a group including curators, artists, a historian and a conservator met yesterday to discuss issues unique to the conservation of contemporary art. 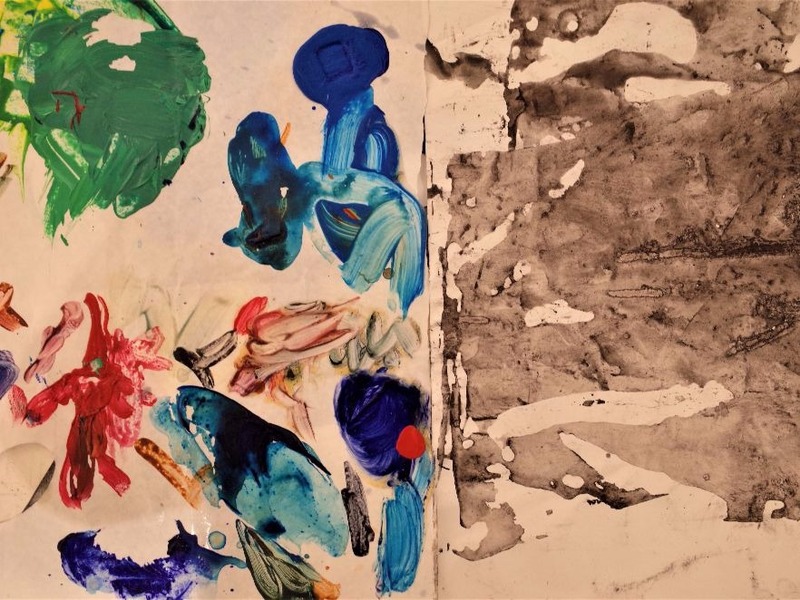 The composition has been reversed emerged from UCL Art Museum's ninth annual collaboration with the UCL Slade School of Fine Art and involves the work of five artists from the Slade - at different stages of their education - participating in a residency. As part of the residencies, the artists were tasked with working with the collections already held by UCL Art Museum, using ideas from the archives to influence their contemporary practices. Artists Grace Richardson and Cyrus Hung both created artworks that raise questions relevant to the keeping of contemporary art. These were discussed during the event. Grace Richardson spoke about how, inspired by paintings made by 17th century artist Hans Troschel on velum held in UCL Art Museum, she created artificial skin that is intended to degrade over time. Her work interrogates fragility and impermanence: how things are kept and how they fall apart. She was also keen to emphasise how her ideas could be tied to the preserved head of Jeremy Bentham also currently on display as part of the exhibition What Does It Mean To Be Human? Curating Heads at UCL at the Octagon Gallery. The head, imperfectly preserved, has the same folds and ridges as are beginning to appear on Grace's work (a cast of the artist's face). Cyrus Hung's work for the show comprises a set of albums, filled with scraps and studio waste found in the Slade studios between March and May 2017. The work suggests the preparatory work and stories that go on behind the Slade degree shows. The anonymity of the items - lists, image print-outs, snack wrappers and stickers, flyers and reminders - indicates the collective nature of how work is produced at the Slade. Suggestive in their ambiguity, Hung's work was inspired by a scrapbook of fragments by Welsh painter Augustus John dating from his time at the Slade in the 1890s, which Cyrus discovered in UCL Art Museum's archives. Key to a lot of contemporary art is its performative value, its ephemeral nature, the fact that it is site or time specific, or intends to in some way interact with the passage of time. The considerations raised by curating some contemporary art affect both artists and museums. They are legal and material, involving questions of control and intellectual property. What constitutes scrap and what constitutes art? Are the preparatory work, fragmentary notes and background materials just as important as the artwork that is produced? How do we conserve, remember or archive artworks that are intended to disintegrate? And what if this preservation does not match up to the artist's idea of the work? The artists were joined by Susi Pancaldo, conservator at UCL Culture and Hannah Wills, a PhD student in history currently working on a collaborative doctoral award between UCL and the Royal Society. The exhibition in total also features work by Sonia Derviz, Eloise Lawson and Amanda Rice. The event, part of the collaboration with the Slade, was intended to form part of the professional development of Slade artists. For artists working with ephemeral work or ephemera, it is beneficial that they take these issues into consideration early on in their careers. The composition has been reversed is free, open to the public, and will run through to 15 December 2017. UCL Art Museum is open weekdays from 1pm through to 5pm in UCL's South Cloisters.